Adapted for the stage by David Wood. Based on the books by Eric Hill. Music & lyrics by David Wood. The play was produced by Oxford Playhouse Productions. First performed at the Oxford Playhouse in 2000, it then toured twice, including London seasons at the Lyric, Hammersmith and the Peacock Theatre. In this adaptation of the very popular SPOT books, David Wood has created an exciting introduction to theatre for small children. Using the simple plot of a birthday party, complete with entertainer, Spot (a puppy) and his animal friends, Steve (a monkey), Tom ( a crocodile), and Helen (a Hippo), helped by Sam and Sally (Spot’s Mother and Father), enjoy the birthday party, reflecting children’s early experiences such as guests arriving, present-giving, game-playing and going home thank-yous. There is a certain amount of fun educational content as well as masses of audience participation throughout. The children are treated more as party guests than simply as spectators. There is plenty of fun for the actors, too, with singing, character movement and, optionally, some acrobatic skills to show off! David Wood writes : Creating a theatre show for three-year-olds is a real challenge! You can take nothing for granted, and have to find the right balance between simplicity and sophistication, not patronising, yet offering clarity and truth. I thoroughly enjoyed rehearsing this show, and sitting in the audience was always a treat. Eric Hill’s characters came off the page even better than I had hoped. 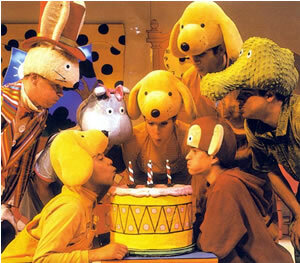 Spot and his friends, although animals, embodied very recognisable human characteristics. Helen was confident, Steve was cheeky, Tom was shy, and Spot was generous and exuberant. Together they brought a festive atmosphere to the theatre, which hopefully gave our audience, most of whom were first-time theatregoers, a very special experience. In the original production there were seven actors, one of whom was also the musical director (keyboards player). An eighth character, Mouse, was a puppet, operated by stage management. “… even very young children sat enraptured …” Richmond and Twickenham Times “This delightful 90-minute show is well-written and well-received …” The Stage “Everyone loves a good party. 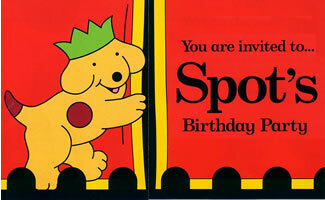 Spot’s is brilliant fun.” Reading Evening Post “… perfectly capturing the spirit of the original … theatricalisation of the classic children’s books is very successful.” Theatreworld Internet Magazine “The children were sucked into a magical world by a show that mixed songs, dance, music and conjuring… for many children SPOT'S BIRTHDAY PARTY will have been their first visit to a theatre. The memory will stay with them forever. Who knows what seeds will have been planted? Daily Echo. The play and piano/vocal score are published by Samuel French Ltd. First Class Professional & Foreign Rights : Casarotto Ramsay Ltd. UK Repertory Rights : Casarotto Ramsay Limited UK Amateur Rights : Samuel French Ltd.